Although all the campervans on the China 2002 trip that entered Tibet made it to Nepal, it was not a foregone conclusion! 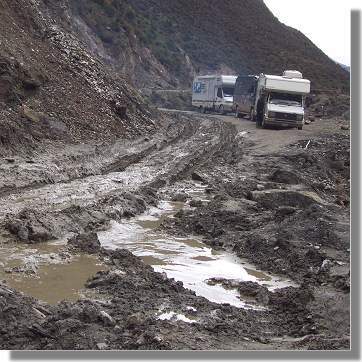 It is only fair to point out to anyone contemplating this trip in 2004/5/6 that many of the roads in Tibet (including the N214, the N318 and the N317) are not suitable for many standard campervans! In 2002 three of the four front-wheel-drive campervans slipped off the road (one over the edge of a bridge). One campervan broke one of its constant velocity joints and had to be carried a 1000km on the back of a truck. Two campervans suffered sump damage due to hitting rocks. The stress of driving an unsuitable vehicle in Tibet ruined the China 2002 trip for several of the participants. Rock avalanches (some still falling). Deep trenches across the road. Deep ruts produced by trucks. Sharp rocks causing multiple punctures. Very steep inclines on slippery surfaces (mud, shale, snow and wet rocks). Very narrow tracks with jagged rocks on one side and a precipice on the other. Whilst it is tempting to say that even the major roads in Tibetan are only suitable for 4x4s or trucks this is too restrictive. With planning, it is possible to drive across Tibet in some modified campervans in relative safety. In 2002 four of the vans that crossed Tibet were fairly standard 3500kg coachbuilt campervans (front wheel drive), two were large panel van conversions (rear wheel drive) and one was a 7500kg 4x4 army truck (Mog). In my view, four wheel drive is not worthwhile for a Europe, China, Tibet, Europe trip for most of the vehicles involved. Whilst it is desirable (essential?) to have at least one big 4x4 in the group, for most of the vehicles the added cost and complexity of four wheel drive is not justified. Having said that I think rear wheel drive is preferable to front wheel drive and that a limited slip diff or better still a lockable diff would give many of the advantages of four wheel drive at a fraction of the cost. When driving on roads like the N317 the important thing is to have the same (or better) ground clearance as the most common vehicle (MCV) on the road (in this case the Dong Feng 7 Tonne truck). This is because any road hazard involving obstructions too big for the MCV will quickly get cleared by the MCV drivers. One of the most common hazards on this road is a central ridge of rocks or mud created by the MCV digging wheel ruts on either side. Each passing truck scrapes the central ridge to a fixed height. If you can drive over this all is well, if not it means hours of work with pick and shovel removing the central ridge and filling in the ruts. A typical standard campervan has around 210 to 250mm of ground clearance. Raising this to say 280mm would make a great deal of difference on this road. The only practical way of doing this is by fitting larger tyres and possibly larger rims and springs. However more important than ground clearance is departure angle. Probably the single greatest weakness of a standard campervan for Tibetan roads is too low a departure angle. 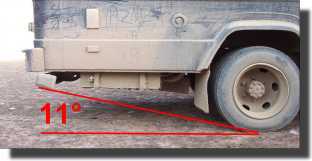 The departure angle measures the ability of the vehicle not to scrape its rear body on the ground when meeting a sudden upward ramp, or when levelling out after a downward ramp. In order to obtain a good departure angle you want a good ground clearance and as little rear wheel overhang as possible. It is also important to consider what part of the campervan will hit the ground if you misjudge a gully and the damage that may be done. Avoid mounting gas (LPG) or fuel tanks behind the rear wheels. Many campervans, particularly long panel van conversions may have departure angles as low as 10°. 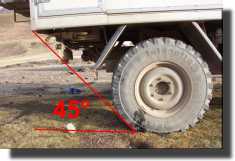 A good off-road vehicle may have a departure angle as high as 45°. I estimate the departure angle of MCV on this road to be about 25-30°. Also worth considering are the approach angle (the same as the departure angle but at the front) and ramp angle. Tyres for a trip like this are a compromise. About 85% of a Europe, China, Tibet, Europe trip is on tarmac. The type of tyre suitable for high speed driving on tarmac is far from ideal on mud, stones and snow. Tyre manufactures usually have a range of tyres from 100% on-road to mostly off-road. One compromise worth considering is to fit four "slightly off-road" tyres to the vehicle and take two "mostly off-road" spare wheels. The spare wheels can then be fitted to the driving wheels for the Tibet part of the trip. Our experience in 2002 was that for Tibet snow chains were more trouble than they are worth. We also found that the vehicles fitted with double rear wheels had some problems with stones wedged between the wheels and seemed to have had more punctures than those with single wheels. Suitable high quality tyres are essential. Bigfoot (with dual rear wheels) did 36,000 km during China 2002 and did not suffer a single puncture or damaged tire. We used factory issue Yokohama Super Steel 735B. There are a number of products (Air-Seal, Puncture Shield, Tyreseal, Ultra Seal) on the market intended to immediately re-seal holes in tyres when punctured. One club member with considerable overland experience tried a product of this type (Note that the product used by Graham Kelly was not one of the above). In 2002 all the two wheel drive campervans had to be towed at some time. Unfortunately many campervans are not fitted with towing attachment points strong enough for towing them out of deep mud. Having four (two front and two rear) strong towing points fitted is a good investment. There were a number of occasions when "preventive" towing was the best solution. If for example a narrow, steep, slippery, section of road with hairpin bends is encountered (and it will be!) then rather than wait for a van to get stuck and then try to back a 4x4 tow vehicle down to it, it is better to assume the worst and tow each van through, with the towing vehicle returning to collect each van in turn. As well as identifiable individual hazards, campervans in Tibet will be subject to 100s of hours of severe vibration. Starter motors, alternators and batteries will shake loose. Fridges and cookers will fall out. Cupboards will fall off the wall. Water pipes will disconnect. Window frames will crack. Dust will get everywhere (yes even there). Vibration and the associated damage to vehicles is not just a Tibetan problem. Extended "corrugated" gravel sections (e.g. the Torugart Pass to Kashgar) and frequent pot holes (e.g. Georgia) are very damaging to inadequately designed equipment. Our experience of Tibetan road (re-)building suggests that two types of tools are desirable. The first is a folding trenching tool (sold in the UK in "Government Surplus" stores for about $10USA). They take up very little space and two or even three per vehicle are recommended. The second tool is a full sized pick axe. These are best bought cheap in Tibet and discarded when no longer needed. One per vehicle is all that can be inconveniently carried. It is also recommended that everyone has wellington boots and rubber work gloves. Do not assume that you will cover more than 100km per day in Tibet in anything other than a small 4x4 or truck driven very hard. The schedule (as published by China Comfort and accepted by China Swan) for 2002 was sheer fiction!